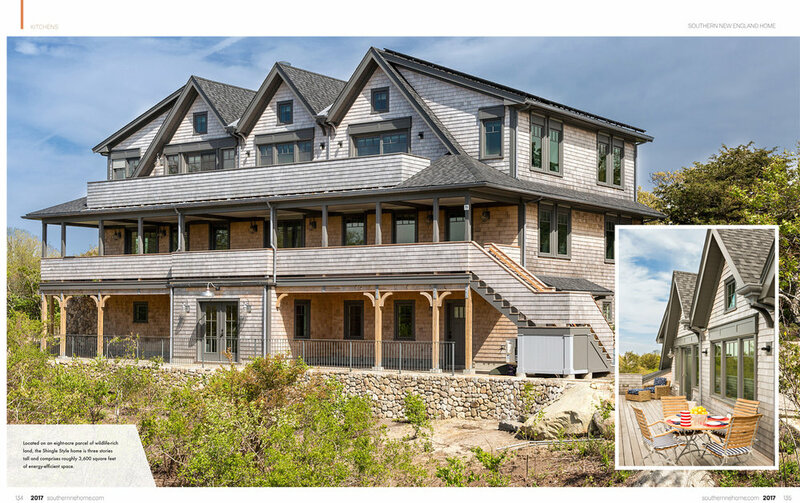 Check out the latest issue of Southern New England Home to see the feature on our Net Zero Quivet Neck House. The Quivet Neck project was developed on an existing site is an undisturbed 8 acre parcel in rural East Dennis with abundant wildlife, rolling stone walls and wetlands. The project will minimally disturb less than 1/4 acre on the site and faces the northwest for distant views of Cape Cod Bay. The proposed design is in keeping with the charming historic neighborhood of East Dennis. The shingled style with three gables on each side will provide a dramatic interior roofline for the main living areas located on the second floor, under the roof. All the rooms are oriented towards the exterior living spaces and the distant water views beyond. The house will be super insulated and produce nearly as much energy as it uses.